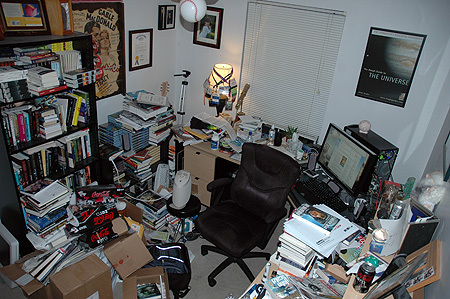 The messiness of a writer’s office may not correlate with the quality of the text being produced, but it seems that the intellectual ferment experienced by every determined writer always leaves a heap of stuff that doesn’t end up in the wine. This entry was posted in Heard Online, Sercon and tagged Amy Thomson, Arthur C. Clarke, Charles Dickens, David Brin, Diana Pavlac Glyer, Jerry Pournelle, John Scalzi, L. Ron Hubbard, Larry Niven, Mark Twain, Nelson Bond, Poul Anderson, Samuel Delany by Mike Glyer. Bookmark the permalink.